The President and Vice-Chancellor of the University of Southampton has been awarded for his outstanding contribution to science and technology and higher education leadership. 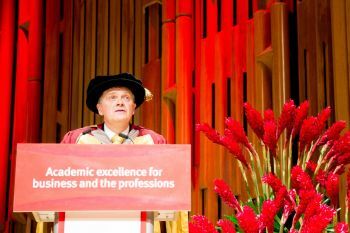 Professor Sir Christopher Snowden was awarded an Honorary Doctor of Science degree (Honoris Causa) by City, University of London in recognition of his outstanding contribution to science and technology and higher education leadership. The presentation was made during the graduation ceremony of the School of Mathematics, Computer Science & Engineering on Tuesday 29th January. City confers honorary degrees on those who have achieved international academic distinction or held major leadership roles nationally or globally in its academic subjects: business; law; health sciences; engineering; mathematics; computer science; the social sciences; and the arts, including journalism and music. Sir Christopher is a distinguished academic, President and Vice-Chancellor of the University of Southampton and an electronics engineer with wide experience in the international microwave and semiconductor industry. After receiving his award Sir Christopher urged graduands to be relentless in pursuing their goals. In order to succeed it is important to differentiate yourself and have skills which others value. Following the pack will not always lead to a desired career. Sir Christopher was born on 5th March 1956 in Kingston-upon-Hull. From an early age, he enjoyed making things and understanding how they worked. His parents sparked his interest in electronics by giving him a valve radio which, being a budding engineer, he immediately took apart. He studied electronic and electrical engineering at the University of Leeds, gaining a BSc in 1977, and an MSc and a PhD in 1982. His PhD examined microwave oscillators for novel radar applications and semiconductor device modelling. His further ground-breaking research in the area later led to him being awarded the international IEEE Microwave Prize, only the second UK citizen in 60 years to receive the recognition, followed by a Fellowship of the Royal Society. Sir Christopher was awarded the Royal Academy of Engineering’s Silver Medal in 2004 for his “outstanding contribution to the UK microwave semiconductor industry” and received the 2012 Outstanding Career Award from the European Microwave Association. He was President and Vice-Chancellor of the University of Surrey until September 2015 and President of Universities UK from 2013 to 2015.